Friends, I was just going through some literature on hypertension and I just saw one quote by Hay, “greatest danger to a man with high BP lies in its discovery, because then some fool is certain to try and reduce it,” and I just wanted to put “that some fool is there going to come and give lecture today.” This was being said because it was thought that hypertension as a matter of fact was a necessity, that is why it was called as essential hypertension and Scott said, not very long back in 1946, "may not the elevation of systemic blood pressure be natural response to guarantee more normal circulation to heart, brain, and kidneys" and that is why it was being called as essential hypertension but today, we know that hypertension is a lethal disease and it is a lethal problem that higher the blood pressure, higher the mortality, higher is the morbidity, and especially involving the brain, the eyes, the heart, kidneys, peripheral vessels, and so on and so forth. So therefore, as the degree of hypertension goes on increasing and as you see from the data that cardiovascular disease doubles with each 20 and 10 mmHg blood pressure increments. So, it is really a serious problem. 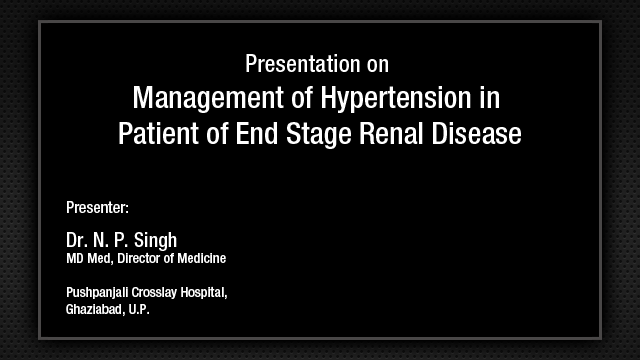 Today, my talk is basically how to manage a patient who has hypertension, has angina. 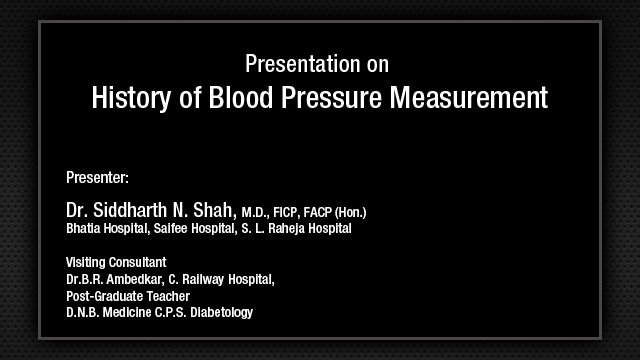 The higher the blood pressure, higher is the cardiovascular mortality so what my talk today is basically on how to manage the patient who has angina, which may be of different types, which is accompanied with hypertension. For example, angina occurs because of the obstruction in the coronary arteries and this can be nothing but like a chronic stable angina. Here is a patient who has got severe disease in the circumflex vessel and there can be another patient who has an acute coronary syndrome who also presents as an angina who has got an obstruction into the left main artery and that can be presented as an acute coronary syndrome. Angina manifestations are not just plain and simple. Remember one thing, do not take angina just an angina as a chronic stable angina with hypertension, angina can manifest and can be accompanied with so many other varied co-morbidities and co-conditions. Say for example, a patient can have chronic stable angina which is totally uncomplicated. The patient’s ejection fraction is normal. He has no diabetes and he has no albuminuria. On the other spectrum, one can have angina which is unstable angina and acute coronary syndrome. Angina can also present as a post myocardial infarction. It can be present in the patient who has left ventricular dysfunction and heart failure. It can be accompanied with arrhythmias like atrial fibrillation, flutter, ventricular premature beats, or sometimes in some patient more malignant arrhythmias like ventricular tachycardias. Associated comorbid conditions can be diabetes, albuminuria, and very very important which many of the people do not realize is the increase in the LV muscle mass. This is very important because I will touch upon this and how to manage all this. So, just managing and trying to bring down the blood pressure and controlling his angina is not enough if you have to manage a patient who has got angina. You must remember angina is a symptomatic manifestation of co-existing or existing coronary artery disease which may be from mild, as I showed you in circumflex vessel disease or can be very malignant which can be like an unstable angina can lead to myocardial infarction. So, you have to achieve not only the relief of symptoms but you have to control hypertension to the target level by reducing and also reducing the left ventricular muscle mass. We have to see that whatever drugs you use, you will try to achieve the reduction in the death rate, improve the endothelial function, reduce death rate, myocardial infarction, heart failure, revascularization, and cerebrovascular disease and prevent chronic kidney disease. So, whatever drugs you use, single or combination, you must achieve these goals because you know that by the time the patient has come to you with angina, he already has got significant, along with hypertension, co-existing already a target vessel damage to his heart. So to achieve all these goals, these should be the goals whenever you want to pick up a drug or a combination of the drug to manage a patient who has angina along with hypertension. Say for example, here is a patient who has angina. You can see already the ECG showing a severe left ventricular hypertrophy and you see left ventricular muscle mass, he has already developed a severe left ventricular hypertrophy and there is lot of data available that if your left ventricular muscle mass is more than 125 grams over the body surface area as compared to the patient who have got less than 125 grams, the mortality is different. The mortality is much higher in the patients whose left ventricular muscle mass is more than 125 grams. Also, when you institute a drug you must keep on doing serial echocardiograms because you must know that if you could bring down the left ventricular muscle mass significantly over the next one or two years' time that is a drug which is helping the patient in controlling not only his hypertension but also taking care of his cardiovascular morbidity or target organ involvement. So, you have to see that you give drugs which not only control his hypertension, control his angina, at the same time by serial echocardiograms we should try to estimate the left ventricular muscle mass to see and ensure that the left ventricular muscle mass is reducing by the drugs that you are giving. So therefore, what are the drugs that we can use in a patient who has got angina with hypertension? Now, we go to the JNC-7 algorithm because JNC-8 guidelines are still not available to us. But just let take this as a benchmark, and look at the benchmark, you come down to the initial drug choices, divided into two with compelling indications and without compelling indications. Now when the patient has got angina, it is a compelling indication because he has already got a target organ involvement. This is a compelling indication therefore you have to look on the right side of the slide and see the antihypertensive drugs that are indicated are the diuretics, ACE inhibitors, angiotensin receptor blockers, beta-blockers, calcium channel blockers as the need may be. So therefore in this particular group of patients who have got angina, hypertension, lets see out of these four or five groups of drugs which will be the most ideal drug, either a single drug or combination of drugs for a given patient. First of all, the principles of management in angina concern number one is to increase the blood supply. To do either an angioplasty or do coronary artery bypass graft surgery which will improve the left ventricular flow by opening of the vessel or doing a bypass you will increase the coronary artery flow so that will relieve his angina. Now suppose the patient is either not willing or is not a suitable candidate for either one of these two revascularization procedure or you feel that the patient can still wait, the disease is not so extensive, the patient can be managed with medical line of treatment then your effort has to be to reduce the myocardial oxygen consumption. To reduce the myocardial oxygen consumption, attempt to reduce the blood pressure and afterload, reduce pulse rate, reduce platelet aggregation, reduce contractility, achieve peripheral vasodilatation so that the blood pressure falls down, improve left ventricular function. Also you must which is not mentioned on the slide, which I will show in the course of few slides give drugs which can improve the endothelial function. Today, we have got drugs which are antihypertensives, but at the same time also improve the endothelial function. Now let us look at what are our choices. The most important choice is group of drugs are the beta blockers. As you know, beta blocker have got all the salutary effects I have talked about. All of you know it reduces the heart rate and reduces the blood pressure and it reduces the contractility of the heart. Many people do not realize that the beta-blockers also have got an anti-platelet effect. They reduce the platelet aggregability. That depends upon the beta-blocker that you use. Nebivolol has got the maximum effect of reducing the platelet aggregability. Now you have got heterogenicity with in the beta-blocker class. You have got some which have beta-1 and beta-2 selectivity, vasodilatation properties, and intrinsic sympathomimetic properties so therefore you have to literally select which are the groups of beta-blockers or which particular beta-blocker you would like to take in for your patient. As a mater of fact, there has been an evolution right from the time of propranolol which came in 60s in the market and basically we divide beta blockers into three generation. First generation are propranolol, then we went to metoprolol, and now we have come to the third generation in which we have either the carvedilol, we have nebivolol which are the drugs which are many times used for some added advantage. We will come to that in which particular subset of patients we would prefer to use carvedilol if you have to use in a patient who has got angina and hypertension. So therefore, if you look at the BP reduction by beta-blockers, the mechanism are traditional that is a first and second generation versus the third generation and the third generation beta-blockers decrease blood pressure largely through reducing systemic vascular resistance because they have got alpha-1 blocking properties as well and if you look at the beta-blocker evidence over the period of last so many years, this is a summary of secondary prevention trials of beta-blockers when the patient who has already got angina you are using the beta-blockers to prevent future events. It is a secondary prevention; it is not a primary prevention. As a secondary prevention, you can see the maximum effect comes when you give it from the point of view of secondary prevention. For the acute treatment and acute myocardial infarction or acute coronary syndrome perhaps they may not be as effective but when you give it for secondary prevention particularly after myocardial infarction if the patient has got hypertension you have got the maximum advantage and if you see there has been overall advantage. If you look on the left side of the vertical bar, if you give beta-blockers, the patient gets relief or gets improvement or has an advantage. On the right hand side, the patient has no advantage so you can see in all three indications that is acute treatment, secondary prevention, and overall beta-blockers have got salutary effect. Now, I thought I will give you in form of case scenario. I will show you two case scenarios which are totally divergent and see how you would like to select your particular beta-blocker or any other drug to combine along with the beta blocker. CASE #1: Here is a patient who is a male 54 years, obese built, increase abdominal girth. He has got an angina on effort class II. His blood pressure is 260/92. His pulse rate is 92, slightly faster pulse rate. His coronary angiogram shows obtuse marginal circumflex branch 70% obstruction. His posterior descending is 100% with collateral recent angiogram which I showed you right in the beginning. His ejection fraction is normal at 55%. Since this patient’s angina was only class II, he had circumflex lesion in the right coronary artery lesion which was co-lateralized. Left main was normal. LAD was normal. He opted the "let me try medical treatment," so he becomes little low risk patient since angina is not severe. So, we agreed that let him go on a medical line of treatment but told that in case you do not get relief, we will do either angioplasty with stents or incase we find that well by the time the disease has progressed to the LAD or to the left main then he can go for coronary artery bypass graft surgery also. So now let us see what are the drugs which we can use in a patient like this. For example, the best drug combination for him would be #1 will be beta-blocker because beta-blockers will control his angina. He is already slightly tachycardiac. His blood pressure is 92. You can select any of the beta blocker because his ejection fraction is normal. Otherwise, if his ejection fraction is low, carvedilol will be the drug of choice, so you can choose either propranolol but of course propranolol now has gone out of fashion so you can give him metoprolol, you can give him nebivolol, you can give carvedilol, whatever drug you want to give him you can pick up and then give him a drug. There is an additional benefit of beta-blockers. They decrease the frequency of sudden cardiac death and VPCs. They improve exercise capacity. They have got favorable cardiac remodeling and reduced risk of atrial fibrillation. Same benefit in nonischemic patient also. Can be used in severe heart failure, especially carvedilol, and equal benefit in males, females, blacks, diabetics, and elderly. So this is the drug which will be a drug of choice. Now do we add any drug to this, look at the American Heart Association’s scientific statement, the target for the patient who has got coronary artery disease, stable angina, acute coronary syndrome or acute coronary syndrome following STEMI target is pretty low, less than 130 and less than 80 mmHg, quite possible and very likely. You perhaps may not be able to achieve this target only with beta-blockers that is #1. #2 in a patient who has already got kind of heart problem has, already got coronary artery problem; one would like to give him additional drug which will prevent the future events. 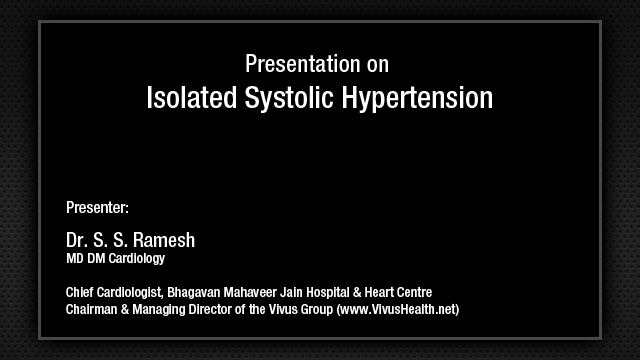 As I showed you in the first slide, the aim is not only to control angina or control hypertension but also to prevent future episodes of death, myocardial infarction, heart failure, or revascularization. The target is also stiff to achieve only with one drug so therefore it is always better in these patients to combine with some another drug. What are drugs available to us to control angina and to control or prevent the future events? The drugs which are available today are either ACE inhibitors, ARBs, or calcium channel blockers. ARBs or the ACE inhibitors are basically given for the cardioprotection to prevent future events. There are several trials available with captopril, with ramipril, with trandolapril and you can see in the trials like SAVE, AIRE, TRACE, and now the HOPE study have shown that when you give them any one of these ACE inhibitors, there is a mortality reduction and this is irrespective of the fall in blood pressure. The fall in the blood pressure was very minimum, yet there was cardioprotection indicating that they are basically cardioprotective drugs. What about the patient’s if angina does not get controlled, the blood pressure also does not get controlled, what about the calcium channel blockers? Yes, calcium channel blockers are very powerful coronary vasodilators as well as the peripheral vessel dilators. They have more effect on the peripheral vessels and therefore can cause severe fall in blood pressure. That is why you must have read in the papers, in the journals, that today short-acting nifedipine is not given for control of angina. It is only for acute episode that you can give because they are very powerful vasodilators. There can be sudden fall in blood pressure precipitating a myocardial infarction in a patient who has got an acute coronary syndrome. However, a sustained-release calcium channel blocker like nifedipine can be very useful added tool for controlling the patient’s angina and blood pressure in case he is not getting control with the beta-blocker and the addition of the ACE inhibitor or ARB. Also it has been found that nifedipine is not only powerful vasodilator, but because it activates nitric oxide synthase, it has got an endothelial protection effect. It reverses the endothelial dysfunction. So it is an added advantage in case you want to use a calcium channel blocker, may be I think sustained release nifedipine may be a good drug to combine in these patients. Recently, the fifth generation of the calcium channel blocker, cilnidipine which is being used extensively in the patient with hypertension especially for the reno protection, but one effect which I saw in the literature that there has been reduction in the heart rate significantly greater in the cilnidipine group than in the amlodipine group. Now any drug which brings down the heart rate in the patient who has got angina, I will postulate that will have salutary effect on the control of the angina, but I think more trials, more data has to be available to see that this effect is certainly available with the cilnidipine. CASE #2: This is a 65-year-old male. He had an anterior wall infarction six years back. He had post myocardial infarction, CABG five years back. He has got shortness of breath class II with a low ejection fraction of 35%. He is nondiabetic; however, his creatinine is 1.4. Now, there are certain things in this patient, if you want to prescribe any drug you have to be little cautious. First of all, he has an anterior wall infarction. He has symptoms of shortness of breath, i.e., LV dysfunction. His ejection fraction is 35% and very important his creatinine is 1.4. If you were to calculate his GFR looking at his age and body weight, you will find possibly GFR may be less than 60. So therefore, if that is so you have to be very careful and choosy about the selection of your ARB or an ACE inhibitor to ensure that the potassium does not go up and his creatinine does not go up. Not that at 1.4, ARB or ACE inhibitor is contraindicated but all that I am saying, you have to be little cautious in these patients. There has been risk reduction with all the beta blockers, especially in the subset of patients like this who had a myocardial infarction and low ejection fraction. All types of beta-blockers especially carvedilol, metoprolol, and bisoprolol, these are three drugs which have been used in the patients like this who have got a low ejection fraction, LV dysfunction, myocardial infarction when these three drugs in the beta blocker group will be very effective. There have been several trials on the beta blocker mortality trials in the patients who got heart failure, MERIT heart failure trial with metoprolol, COPERNICUS trial on carvedilol and the CIBIS-II trial on bisoprolol. All three agents have been shown to have a salutary effect on improving the left ventricular ejection fraction as well as reducing the mortality. Now, which one to chose, do you choose carvedilol or do you use metoprolol. There has been a trial called as COMET trial in which there was a head-to-head comparison between the carvedilol and the metoprolol and the patients were assigned to 2 arms and one found that carvedilol proved to be superior to metoprolol. Though of course both of them did bring down the mortality rate, they gave an advantage; however, the advantage was greater with carvedilol. Only thing is that I have seen and we all ourselves do not prescribe the optimum doses of carvedilol. The optimum doses of carvedilol is to go to 25 mg twice a day. You start with smaller dose, but until and unless you give such high doses you will not be able to achieve the hypotensive effect in patients whom you decide to put on carvedilol. As a mater of fact if you look at carvedilol its beta-1 blockade is 3+ and beta-2 blockade is 3+ and it has got an alpha-1 blockade of 3+. It can cause quite a good degree of fall in blood pressure. As opposed to this metoprolol has got only cardioselectivity, it has got beta-1 blockade properties. Bisoprolol has only beta-1 blockade property. Out of all this when the patient like this, what I showed you, the drug of choice should be carvedilol in these patients. There has been a drug which I am sure all of you have been using, nebivolol, and this is one drug which also has been found to improve the endothelial function in addition to controlling blood pressure and angina. Now, what about these data between the ACE inhibitors versus the ARBs in improving the LV ejection fraction like the patient I have shown you. When it comes to ACE inhibitor, all trials have been positive. None of the trial have shown that the ACE inhibitors have negative benefit, they all have got benefit. It depends upon whatever drug you use. As a matter of fact it is always said that the choice of ACE inhibitor is more by wits than by wisdom, so whatever you want to use, you use. You want to use more expensive, use more expensive like Cardace or ramipril. If you want to give cheapest one, you can use the older one like enalapril, but all of them have been shown to have beneficial effect. As opposed to this, ARBs have been salutary, but there has been always some doubt in some trials. Now, I will come to last two or three slide to show certain things which we never bothered to look at. When we treat the patient like this angina, low ejection fraction, past myocardial infarction, now the patient has got heart failure symptoms. Couple of drugs which we have forgotten or we forget to write down are the aldosterone antagonist. Remember that they are very very important in managing a patient like what I showed you and especially giving them a drug like spironolactone if you look at the trial called, RALES trial, patients who are put on spironolactone had got reduced mortality over 36 months period. It is a very important drug and similarly another drug, like eplerenone, as you know, which has been used or tried in EPHESUS trial when in the postmyocardial infarction eplerenone has been showing to reduce mortality. So, any one of these two drugs can be used to control hypertension and if you see when you give spironolactone to the patient you have to wait and at the end of 6 months you will find that the systolic as well as diastolic pressure comes down. As a matter of fact, some patients who do not respond to your conventional treatment, add sort of 50 mg or 25 mg of spironolactone a day, you find their blood pressure comes down. Only thing is that you have to be careful in a patient like this who has creatinine of 1.4. Combining spironolactone, combining ACE inhibitor or ARB you may inadvertently increase the potassium level and the creatinine level, so be careful there is a word of caution in this patient. One more thing which many times we forget to look at, and this is not uncommon, is the Conn syndrome. Primary aldosteronism is not an uncommon condition. In various trial and various literature articles, the incidence has been reported to anywhere from 8% to 20% of all hypertension patient, it is not a small incidence. So, suppose you see a patient who has got persistent hypokalemia, withdraw his diuretics, any thiazide or loop diuretics, do his potassium after wash out period. If you find the patient has persistent hypokalemia, suspect primary aldosteronism. Simple test like doing the aldosterone levels or doing an MRI. In the MRI, you will see there is an arrow, a horn-shaped shadow there which is a Conn’s tumor, you will pick up. In such patient nothing else but to control the blood pressure, spironolactone will be enough or eplerenone will be enough to control his hypertension. Of course you will give some other drug to control this, but you will be sure that you will not give any thiazide diuretics. Another thing, very common, which is not recognized but we angioplasters recognize is association of renal artery stenosis with coronary artery disease. These are the patients who have got documented coronary artery disease, 8% to 15% patients who have got coronary artery disease have significant renal artery stenosis and that may be the reason for the uncontrol hypertension in these patients, so therefore do not forget to get their duplex Doppler done to see if they have got an associated renal artery stenosis and treatment is simple. As a matter of fact the first line of treatment is to try to manage them medically. If they cannot control their hypertension then of course the option to the renal angioplasty is always available. One more thing and the last thing, I want to sort of highlight that several of these patients in your clinics will come back and ask you a question. Because all of them are older group, senior citizens, and they are on the antihypertensive drugs you have given them and majority of the antihypertensive drugs will lead to erectile dysfunction. This is not an uncommon complaint the patient will come back to you. This is one of the challenge you have to accept and advise the patient what to do. Many of them will come to you back with erectile dysfunction and beta-blockers, calcium channel blockers, and ACE inhibitors. All three of them along with diuretics of course, diuretic is not the drug which I was advising but all these three drugs can combine lead to erectile dysfunction, so what should we advice to them. Do you all allow them to take sildenafil or not. Let me show you some data on this. If you look at the patients who had no antihypertensive drugs versus who had antihypertensive drugs and when you give them sildenafil, you will find that the difference was not significant. There was fall in the blood pressure with sildenafil and no antihypertensive group, slightly more drop in the systolic and diastolic blood pressure in the sildenafil group. So if your patient is on beta blocker or a calcium channel blocker and not very large doses as we call it complex combination, you can certainly advise them to go ahead and take sildenafil. So, this is one of the challenge, you have to see, what has to be done or advice to the patient like this. Only thing is that you have to be sure that your patient has no concurrent use of nitrates because you are going to advice him, the patient has got angina, he has hypertension so you are going to advice him nitrates. So ensure that the patient is not on nitrates. If you want to use sildenafil tell him to take nitrate free period of 48 hours. Let him have a washout of nitrates from body for 48 hours then you can use the sildenafil. But patient being on simple drug regime like some small dose of beta-blockers, small dose of calcium channel blocker, no problem you can advice them, but suppose if he is on a very complex, like very large dose of beta-blocker and large doses of calcium blockers and very large dose of ACE inhibitors or ARBs, perhaps in such a patient you have to be very cautious. Of course, you have to see that the patient is not in left ventricular failure, he has no creps, he has no S3 gallop, and little bit careful about advising him sildenafil in such a situation. Every lecture must end, I always say with a CME question. So, I have got CME question to you and I would like you to answer this questions. Which one is the more hypertensive during this exercise test, doctor, patient, none, or both. Who says doctor, who says patient, and who says both, and who says none. I say none because both of them are happy. Happiness does not bring hypertension. Thank you very much. QUESTION FROM AUDIENCE: Sir, using beta-blocker and getting an heart block on an ECG, particularly a trifascicular block, do you have to be externally cautious when you initiate beta-blocker, particularly in ischemic heart disease and how do you follow them up? Dr D B Pahalajani: See first of all beta-blockers do not cause a trifascicular block because, the effect of beta blocker as with the proximal conduction system at the sinus nodal level and the AV nodal level it does not cause any distal blocks. So it does not cause bundle branch block, it does not cause a trifascicular block, and does not cause any intra-atrium block, so whatever blocks occur, they occurred proximally that is #1. You are certainly right that even if it is a proximal block it is mater of concern because you do not want to reduce the pulse rate to such a level that the patient get symptoms, because ultimately when the pulse rate goes down below 50, 55, 40 and if he is not use to it like athletes are used to pulse rate of 35 and 40, but he is not an athlete, so he may feel asthenia and may feel weak so then you have to reduce the dose of beta-blockers in these patients. Though it may not be even AV block, it may be sinus nodal block, so the patient may develop a sinus bradycardia. In such a patient you have to reduce the dose of beta-blockers and may be increase the dose of calcium channel blockers or increase the dose of ACE inhibitors or ARBs certainly you have to be careful about these patients. Well some of these patients who may have had sinus node disease say for example preexisting sinus node disease, in these patients even a small dose of beta blocker you give them, suppose you started with metoprolol 25 mg b.i.d., or you gave him an extended release of metoprolol XL preparation, you found that after seven days his pulse rate has further fallen down. It is quite possible you go back on his old ECG, you find that he has sinus bradycardia and may be he has a sick sinus syndrome. In such a patient you probably should not give beta-blocker and fall back on calcium blockers and combine with the ACE inhibitor or ARB. QUESTION FROM AUDIENCE: Doctor, you just made a passing mention about superiority of nifedipine in terms of endothelium, now does that affect is not there for amlodipine. Dr D B Pahalajani: No, that is what the nifedipine people are saying that is the basic difference between nifedipine and amlodipine. While nifedipine, equally brings down the pressure, but it has got salutary effect on the endothelial function whereas amlodipine has no such function. So, that is the basic difference between the two. QUESTION FROM AUDIENCE: I am sure that most of us, if you see the combination, you will have atenolol with nifedipine plenty of combination, amlodipine with atenolol combination. there is no combination of nifedipine with metoprolol. I think Eris can make a note of it. Dr D B Pahalajani: You see I will tell you nifedipine went into very big disrepute for about five or six years back when the data came out, there was an adverse reaction of precipitating acute myocardial infarction because in those days we ourselves also use to write down short-acting nifedipine and may be some time we would write nifedipine retard, but many time we write down nifedipine say 10 mg three times a day or 5 mg three times a day, it was short acting 6 hourly working acting nifedipine, but when the data came out that when you give such acting nifedipine in some patient where you were not very careful about eliciting the history of the patient, some of them were acute coronary syndrome and unstable angina, in these patients when you give nifedipine sudden precipitous fall in blood pressure precipitated myocardial infarction. So that is where headlines came that “nifedipine precipitates heart attacks” and that was for particular type of nifedipine. But when you give sustained release nifedipine, it has no such effect. There has been actually GITS trial and so many trial have been, ENCORE trial, INSIGHT. Actually largest trial has been ACTION trial, and they have found that there has been no such effect with the sustained release nifedipine. But since the fear is there in our mind and now the other drugs are available, like cilnidipine is going to be available large scale in market, the amlodipine is available, but no body is now going back into looking at the endothelial function aspect of the nifedipine because now you have got ACE inhibitor and ARBs, which improve the endothelial function. You have got statins which are been used so you have got another salutary effect on the endothelial function, so people have forgotten that particular function of nifedipine. They say why unnecessarily write on a prescription where we are not sure. QUESTION FROM AUDIENCE: I would just take a take on role of beta blocker in a patient who is also an asthmatic. You did this display the kind of beta-blockers that we have hypertensive, CAD patient who is extremely asthmatic would you be happy enough to use beta-blocker in such a patient or any subset of beta-blockers that would be safe? Dr D B Pahalajani: Very good, excellent question, and as a matter of fact, there is a slide on which they have shown that tolerance of the patient to the traditional contraindications to beta-blockers and one of them was COPD and in all this traditional contraindication 85% of patient could tolerate beta-blockers, only 15% patient who could not tolerate. Now question comes for the patient who have got bronchial asthma. Very good question. In these patients you should try, if you want to give a beta-blocker, should try cardio-selective may be something like metoprolol which you can try. But again the selectivity is purely dose related. Literature says 200 mg, but I would say in Indian population were body surface area is small, body mass index is small, I would feel that 100 mg should be considered as the cut-off dose beyond which we should not go, but up to 100 mg cardioselectivity is preserved, so you can try, but still even up to 100 mg when you keep on giving them for longer time some patient will develop bronchospasm, so then you have to switch over from say beta-blockers to either calcium channel blocker or ACE inhibitor or ARB, but you can still try cardioselective beta-blocker, remember it is dose related.